El restaurante Thali se confirma como una de las alternativas que mejor ha sabido recuperar el sabor del sur de Asia en el centro de Barcelona. Se ubica en el Eixample, cerca de la boca de metro de Rocafort, y es todo un especialista en la elaboración de curries y platos elaborados al tradicional horno ‘tandoori’. Comer en el restaurante Thali es sinónimo de apreciar su Daal soup (sopa de lentejas amarillas), Arroz gamba biryani y verduras Aloo Gobhi. Entre los principales más destacados de su propuesta de cocina hindú tradicional, hay excelentes elaboraciones como Murgh malai tikka (muslo de pollo marinado), Chicken mango y Gambas al curry tradicional. Como colofón a una experiencia que se presume de gran autenticidad, el restaurante Thali te obsequia con dulces detalles como kulfi, haiwa y diferentes lassi. Para los amantes de la cocina típica de la India, y para los que la quieran descubrir, esta es una exquisita oportunidad. ¿Te la vas a perder? Overall pretty good. A couple of our curries had too much salt, but otherwise it was pretty nice. Good service, and good ambience. What an amazing place! Whilst somewhat off the proverbial beaten track well worth the effort to visit and can wholeheartedly say that this place can be recommended. 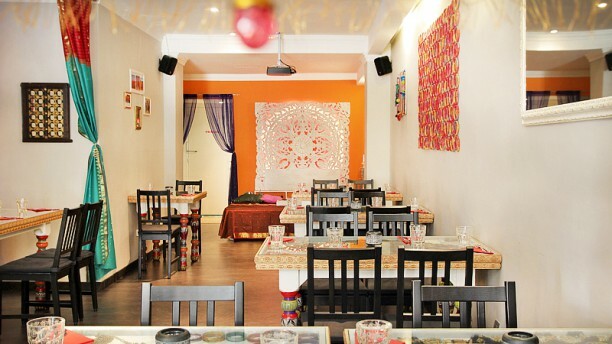 The decor adds to the ambience and the staff are attentive. Ensure you book online as was pleasantly surprised by the discount by having made the reservation online. Only thing to note is portion sizes, which are generous, so do ask when ordering. Will definitely endeavour to visit again, well worth visiting! i was there yesterday with my boyfriend and we ordered the dal makhani and the praw biryani. We also had the mango cream as dessert and some fried balls (sorry, I dont remember the name) and everything was delicious. We have been to a few indian restaurants and were strugling to find one that was close to the one we loved when living in Ireland and now we are glad we found Thali. We will definitely come back many times. The best Indian restaurant in town! The experience at Thali was quite good; i was a bit disappointed about the food taste that was not so tasty and spicy like I thought. The atmosphere is overall pleasant but some details in the decor are a bit neglected. Good service but at the end of the meal I expected the classic digestive spices as in any other Indian restaurant. Best Indian food we’ve had so far in Barcelona, and very nice ambiance. A fantastic choice. I booked Thali for our work Christmas lunch. There were 8 of us and everyone really enjoyed their meal. The food was delicious, the service was excellent and the price was excellent. We had a 30% discount. We will definitely be back again. Thank you making out Christmas lunch so enjoyable . Good food at a good price. Would go back. Food was good and quantities enormous. We couldn't finish half of what we ordered! Great little Indian restaurant. Quirky and cool. Food tasty and reasonably priced. Highly recommended.